Below is our review of the Acer C7 Chromebook, a 11.6" laptop, featuring 2GB RAM, 320GB hard drive and Chrome OS. The Chromebook typically sits somewhere between laptop and netbook - it is more portable than a laptop due to smaller size and lower weight, and faster to run than a traditional Windows based laptop, due to Chrome OS. Typically slightly larger than a netbook, and thus more practical to work on. The downsides are that you cannot load Microsoft Word, Excel and the rest of the MS Office suite on it, as it does not have a Windows Operating System. Usually a Chromebook will be slightly cheaper than the equivalent Windows based laptop, as it doesn't have a software license to accommodate within the price. 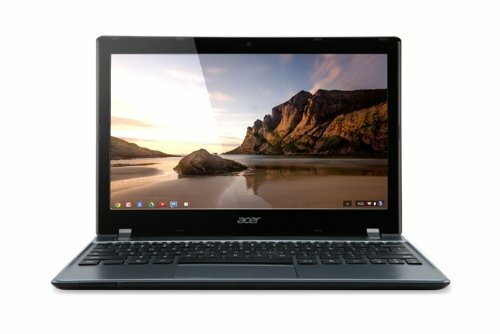 This Chromebook is manufactured by Acer - renowned for making very good value laptops - perhaps a less trendy manufacturer than some of it's competitors, such as Sony, Samsung and Apple, but usually offering a more competitive specification as a result. The C7 Chromebook comes with an 11.6" screen - this is smaller than the standard 15.6" laptop - however this does mean the overall size of the notebook is smaller, and thus gives this Chromebook a degree of portability than it's larger relatives do not have. You may be happy commuting with your regular sized laptop, however this Chromebook is ideal for going on holiday with, or travelling, simply as it will easily fit into a moderate sized backpack. Inside you'll find the Intel Celeron 847 1.1GHz coupled with 2GB RAM - which is pretty good especially considering the low cost of this laptop. Due to the operating system, this laptop loads a lot faster than a traditional Windows based laptop. Also there is no need for anti-virus software, unlike a Microsoft based system. Essentially this Chromebook is a powerful tablet with a keyboard and touchpad fitted - you may not get the flexibility that you get with a Windows laptop, but at around £100 cheaper, faster boot up time, and less to worry about, this will suit a lot of users. Ideal for travelling with, browsing the web at home and all basic day to day tasks. If you're looking for a system to carry out a lot of work on, and spend hours in front of, this may not be the solution for you - but for casual users this is a great device. Pros: Very fast to run, quick to load, and just works. Cons: Not Windows based - if you're used to Windows and want perfect integration between your computers, this may not be the laptop for you. Great at what it does, small, lightweight, portable, and highly functional. A great cheap solution to mobile computing.